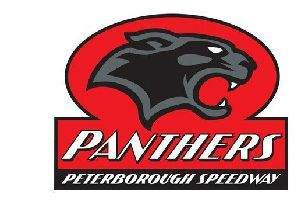 The 2019 Peterborough Panthers team. From the left they are, back, Carl Johnson (team manager), Bradley Wilson-Dean, Hans Andersen, Charles Wright, Lasse Bjerre, front, Rohan Tungate and Ben Barker. He was appointed as a promoter of Panthers late last week – a new role in addition to his post as team manager. It means more influence in the day-to-day running off the track for Johnson, who is also responsible for plotting their success on it. He will work alongside the vastly-experienced Colin Pratt in a new-look promotional duo following the winter exits of former owner Ged Rathbone and another local man, Neil Watson. 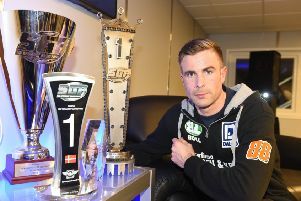 “I’m delighted and proud to become a promoter of Peterborough Speedway,” said Johnson. “This club has been a huge part of my life. “I rode for Peterborough briefly, I’ve had lots of roles behind the scenes and I’ve had a terrific time as team manager. Johnson has enjoyed excellent success in his time as team boss which stretches back to 2014. He steered Panthers to Fours and KO Cup glory at SGB Championship level in 2017 before they retained the former trophy last term. And while the club’ league may have changed ahead of the new season, Johnson is hopeful their winning ways will remain despite the unwanted hiccup of having to make a late change to their line-up following the exit of Craig Cook. He added: “Winning the Fours on our own track back in 2017 was a day I’ll never forget and following it up by beating our East Anglian rivals Ipswich in the KO Cup at the end of that season was also fantastic. “It was great to keep hold of the Fours again last season, but the way the season ended was obviously a huge disappointment. “There’s no doubt in my mind we’d have picked up more silverware had we not suffered so badly with injuries – in fact I believe we could have won the lot. “Winning trophies is definitely the aim again this season. We’ve not come into this league just to make the numbers up. “It’s all about providing a winning and entertaining team for our fans at the Showground and doing everything we can to pick up points on the road as well. I feel we have the riders to do both.